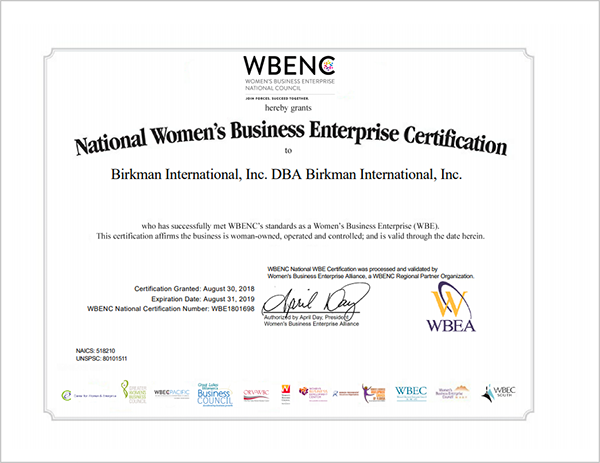 HOUSTON, September 4, 2018 - Birkman International, a business specialized in assessing human behavior and perception, is newly recognized as a Women’s Business Enterprise by the Women’s Business Enterprise National Council (WBENC), the largest third-party certifier of businesses owned and operated by women in the United States. The certification is effective as of Aug. 30, 2018. "Dr. Roger Birkman pioneered The Birkman Method and founded our company driven by his strong convictions and lifelong desire to empower others. We are proud to be certified as a Women's Business Enterprise and continue his legacy. The WBENC recognition provides our company - and many of the businesses we partner with - an important vehicle to support diversity and empower lives."